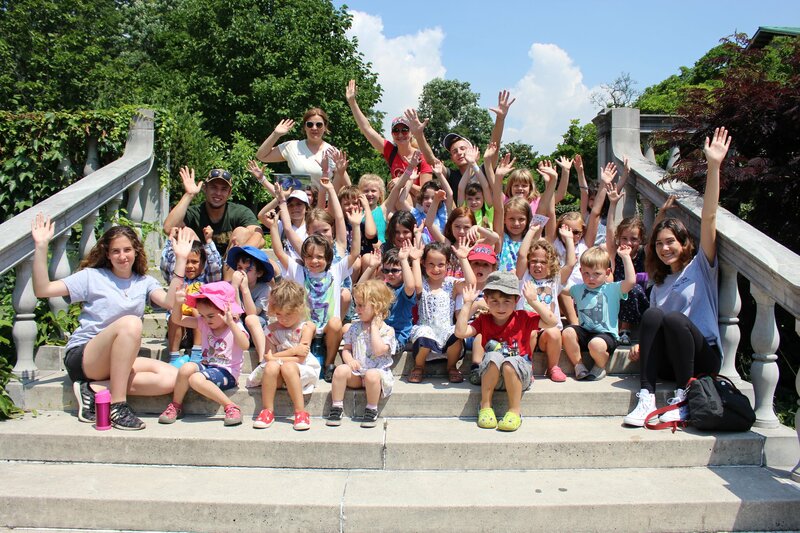 Marks JCH is proud to have welcomed two classrooms full of children to our premier Russian-language immersion Jewish Summer Day Camp program this past summer. It was a delight to observe children yearning to learn each day. Kibbutznik camp is a progressive educational environment in which every activity and interaction offers a chance for fun and learning through games. Campers are exploring the world around them and within them through creative themes using well-known Russian-Jewish fairy tales. Camp components included art exploration; the children engaged with a variety of materials, expressing themselves in new ways physically, as well as via language and theatrical improvisations. Kibbutznik campers learned about world-renowned painters like Van Gogh, Jackson Pollock, and Monet. They created their own works of art in the style of Kandinsky, using his inspired works as jumping off points for their personalized work. Beyond painting, campers made art creations from recycled materials, which were used to help set the table for a beautiful Shabbat celebration and teach the value of caring for our earth in a time of concern about global warming. Afterwards, the children explored the world of sculpture, construction and architecture. The children set off on an adventure across the globe exploring and learning about the many different types of sculptures and architecture that can be found around the world. They created individual sculptures of their very own and collaborated together to create a class sculpture. After their tour of the globe and their exploration of the many facets of architecture, our little Kibbutzniks built shtetls, which were all combined into a large shtetl city! The other focus was on music, dance and theater, as well as exploring children’s folklore via storytelling and literature. The entire curriculum was crafted by our team of teachers entirely in Russian to support the learning of our children in this innovative new experiential Jewish Educational Camp program. As for physical activity, instructional swimming was offered onsite at the Marks JCH. Each day, they enjoyed explorations of the natural environment available through time is spent in Prospect Park. We are extremely excited about the continued expansion of our Russian-language Jewish Educational Programming for families with young children, helping to keep our community connected to its unique Russian-Jewish heritage.